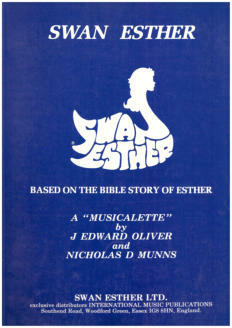 Swan Esther Swan Esther is a musical based on the bible story of Esther. 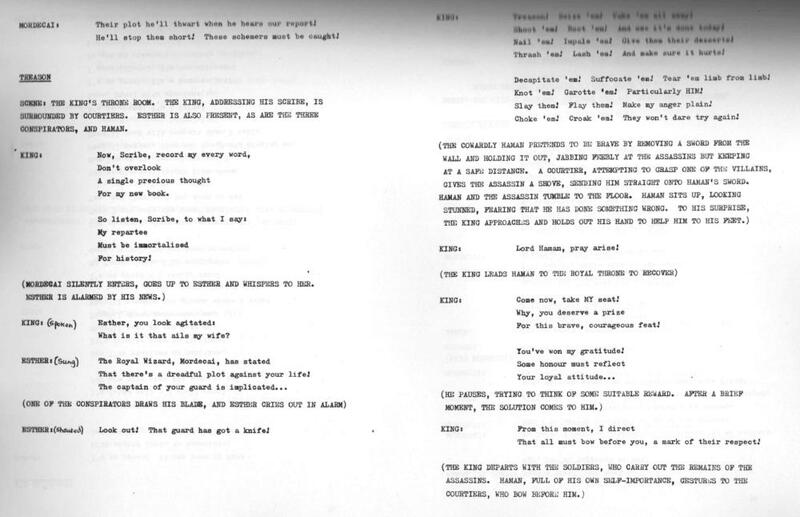 It was written in 1982 by Nick Munns, who wrote the music and JEO, who did the words and the art work. A professional production was staged by the Young Vic in January 1984. 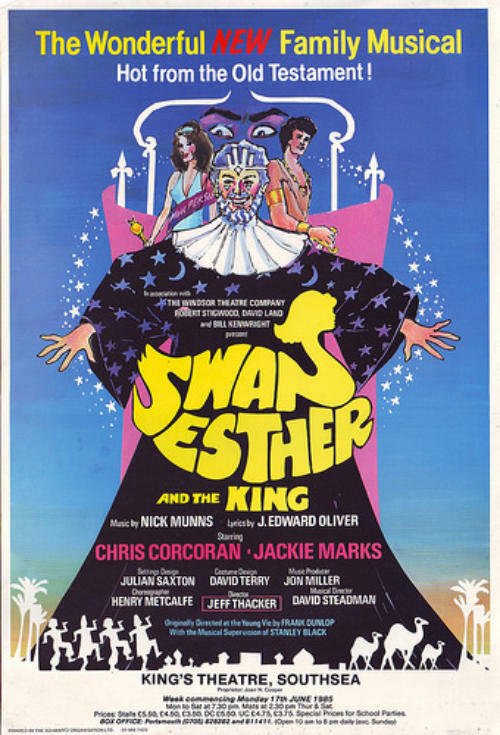 Swan Esther has also been performed by a number of amateur companies. The original soundtrack was published on CD in May 2014 on the Stage Door record label. If you want to read the story, click here. The story It all began when the King decided to run a splendid party to celebrate the third year of his reign. At the same time his wife, Queen Vashti, was running her own party. After seven days of celebrations the King commanded his chamberlains to collect the beautiful Queen Vashti so that he could show her off to all his guests. The Queen refused to appear. As well as infuriating the King, this behaviour was thought to set a bad example to all the wives of the kingdom and so it was decided to get rid of the disobedient Queen. It was agreed that a nation-wide beauty contest should be organised in order to find a new queen. There lived in the King's palace an minstrel by the name of Mordecai. This wise old man, a Median, was the guardian of his late uncle's daughter, a beautiful girl called Esther. When Mordecai heard of the nation-wide search for a new queen he thought Esther would be a certainty and so he took her back to the man in charge of the competitors. Mordecai made a point of telling Esther not to mention that she was a Median. The main competitors were kept in the palace for a year for special grooming and, of these, the most popular became Esther. When she was finally presented to the King she was immediately chosen to be his Queen. 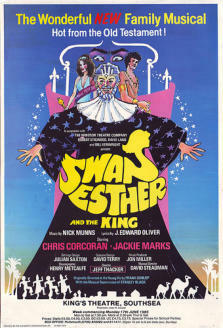 Soon after Esther became Queen, Mordecai overheard two of the King's chamberlains plotting to kill the King. This he told Esther who immediately told her husband. The conspirators were arrested, tried and hanged. The King made a special note of Mordecai's name as he had undoubtedly saved his life. After this incident the King decided to appoint a man in charge of his court. He chose Haman, a ruthless and ambitious man, who immediately began to throw his weight about and expected everyone to bow and scrape to him. This Mordecai refused to do saying he was a Median and Medians bow only to God. Haman was so infuriated that he devised a plan to rid the Kingdom, not only of Mordecai but also of all Medians and he managed to get the King to agree to this plan. 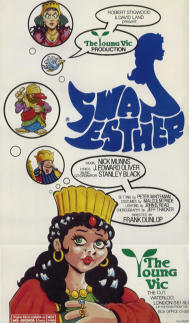 Mordecai was horrified when he heard of Haman's plan and discussed the matter with Esther. She had to devise her own plan as she was forbidden to visit the King unless he sent for her. She decided to glamorise herself and appear at the door of his private apartment. The King was overjoyed to see her and said he would grant her anything she desired. Her wish, she said, was for the King and his Chief Adviser, Haman, to have dinner with her that night. They agreed to this request and had a very good evening and readily agreed when Esther asked them again for the following evening. Meanwhile Haman was becoming increasingly incensed because Mordecai would not grovel to him and thought it would be an excellent idea to erect a scaffold near to the Palace and hang Mordecai that evening. That night the King could not sleep and asked for the book of the chronicles to be read to him. The reader began with the most recent event which had been Mordecai's act of bravery. The King asked if he had been rewarded and was told that he had not. He asked Haman his advice as to what would be a just reward for faithfulness. Haman, thinking the King had himself in mind, made extravagant suggestions. Haman was devastated when the King sent him off to bestow all the suggested favours on Mordecai. By now it was time for Esther's second dinner party which was even better that the first. The King wanted her to choose a special favour. Esther said she chose to save her people, and herself, who were decreed to be slain. The King was speechless when he heard that Haman had made this decree and ordered that he be hanged immediately on the gallows that had been erected to hang Mordecai. Thus the wise and beautiful Esther served her master, the King, and saved her people, the Medians.